Long before the state of Hawaii banned sunscreen containing harmful chemicals, Mana Food's decided to take matters into our own hands and stop selling sunscreen that wasn’t reef safe. The health of the environment, including ocean reefs, is a huge priority to all of us at Mana Foods. Thus, in an effort to do everything we can to do our part on this front we’ve made it our mission to locate, carry and sell the best reef safe sunscreens that we can get our hands on. "Tony Palmer grew up surfing in Queensland, Australia, but moved to the U.S. in the late 1990s for work. He was inspired to start the sunscreen company after seeing bleached and dying coral reefs. He began researching and discovered that chemical-based sunscreens had been linked to the damage. And, he said, he was troubled by the idea of putting the same chemicals on his skin." 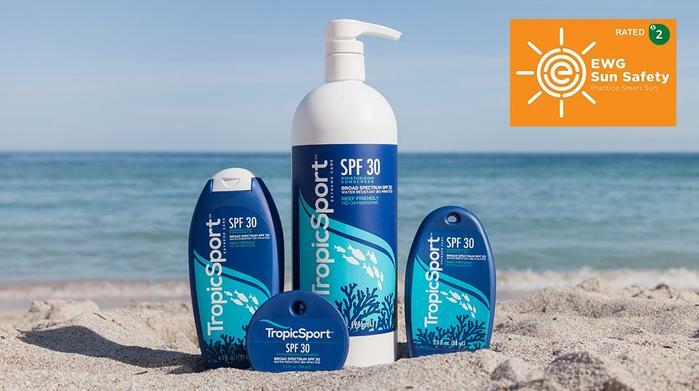 TropicSport is the official sunscreen and skincare brand of USA Water Polo and US Master Swimming and their whole motto is what they call they "The 3 C's." Their sunscreen is gentle and natural enough for daily use, while also designed to last through hours of sun, sweat, sand, and water. Their sunscreen is mineral based and does not contain any harsh chemical active ingredients. TropicSport is cruelty free and is not toxic to marine life. TropicSport donates up to 20% of their sales to like-minded organizations like Mauli Ola Foundation, Surfrider Foundation, Jimmy Miller foundation, and Surfers Healing. TropicSport also attends and hosts events all around the country aimed at informing and educating communities about sun care and skin care. "We offer two Natural Mineral Based Sunscreens without harmful chemicals. No Parabens, no avobenzone or oxybenzone. No Nano particles. They are Reef Safe and People Safe." "We base our claims on an unbiased view presented by the Environmental Working Group, a non-profit organization whose mission is to protect the environment and the people who live in it. Go to EWG.ORG to find out about the Environmental Working Group." "None of our sunscreen contains chemicals. We use all natural mineral based ingredients to block UV rays"
"We don't use any chemicals that have been shown to be harmful to ocean life. We also do not use Titanium Di-Oxide which in some studies has shown to be harmful to ocean life." "We have created a formula that minimizes whitening compared to other natural sunscreens. Our formula is also easy to apply."